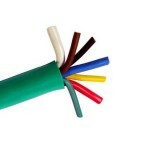 General-purpose primary wires enclosed in high quality green PVC jacket. Especially designed for durable use meeting the demands of anit-lock braking systems. Consists of 8 gauge ground wires, two 10 gauge stop-lamp, constant power circuit wires, and four circuit wires for power of other lamps. All-copper stranded core is higly conductive maximizing current transfer while remaining flexible for easy installation. Heavy-duty compact cable protects insulated conductors against weathering chemicals, and abrasion. Colored-coded conductors enable easy identificaiton.